Faculty and students from Olivet Institute of Technology (OIT) participated this week in the JavaOne conference, May 6-9, 2008 at the Moscone Center in downtown San Francisco. Many took the opportunity to discover the ever-changing technologies in the Java community. 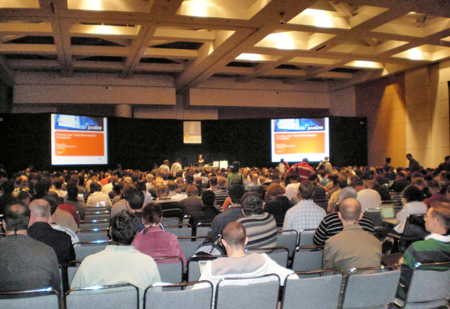 Students armed with free passes provided by JavaOne gained access to a wealth of information and resources, including special sessions on Service Oriented Architectures (SOA), Rapid Web Site Development with Groovy & Grails, Ruby on Rails, Web 2.0, and Google Web Toolkit. Other topics covered included wireless and Secure Java Technology Web Services. The one week conference was described as a valuable experience by students, who expressed particular enthusiasm for one-on-one learning opportunities with industry professionals from companies like SunMicrosystems, Google, and Yahoo. “The conference was a great opportunity for students to learn the newest technology from the leading experts in the field,” said Dean of the Olivet Institute of Technology Dr. Ching-Cheng Lee. OIT conference attendees also took part in a student program called Java University, which offered the courses Java SE Essential and Beyond, Game Server Darkstar, and Building Web 2.0 Applications Using jMaki framework.